I love this time of year! I work really hard to be thankful for things all throughout the year, but I find myself focusing on it all this month. Every year I have watched my friends post on Facebook what they are thankful for. I have been able to do that this November on both my personal and blog Facebook pages. It has made me think of things that I am thankful for! But, I realize I have not done it here on my blog, and I was so excited when my bloggy friend Bex from Reading and Writing Redhead told me about her new linky party: Time to be Thankful! Here is what I am thankful for. 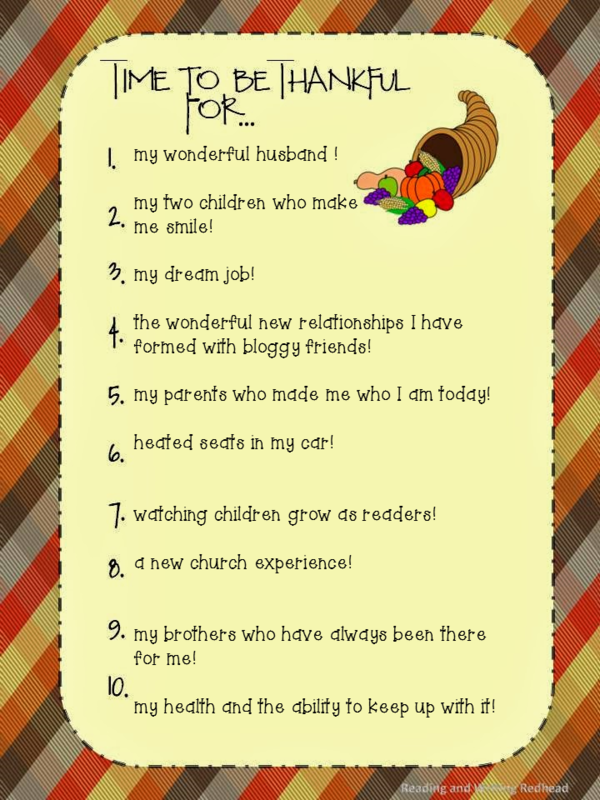 So, what are you thankful for during this time of thankfulness? Link up with Bex at Reading and Writing Redhead and let us know! I am glad things are going so well for you! I really love this time of year, too. Everything just feels so wonderful. Have a wonderful Thanksgiving. You deserve it!